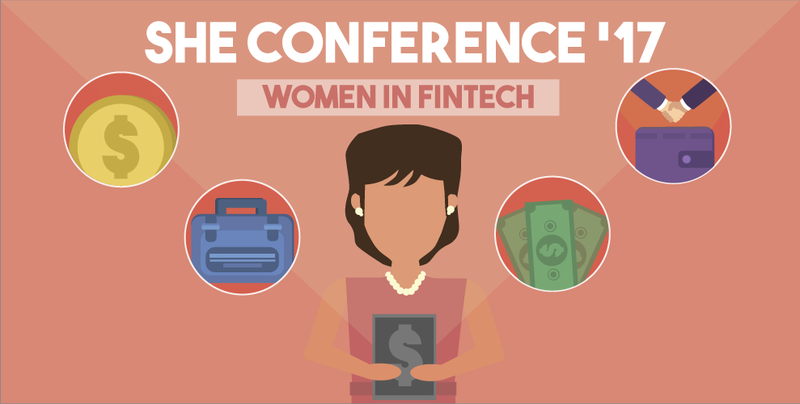 SHE Conference 2017- Women Entrepreneurs in A Finance World: Where Do We Stand? 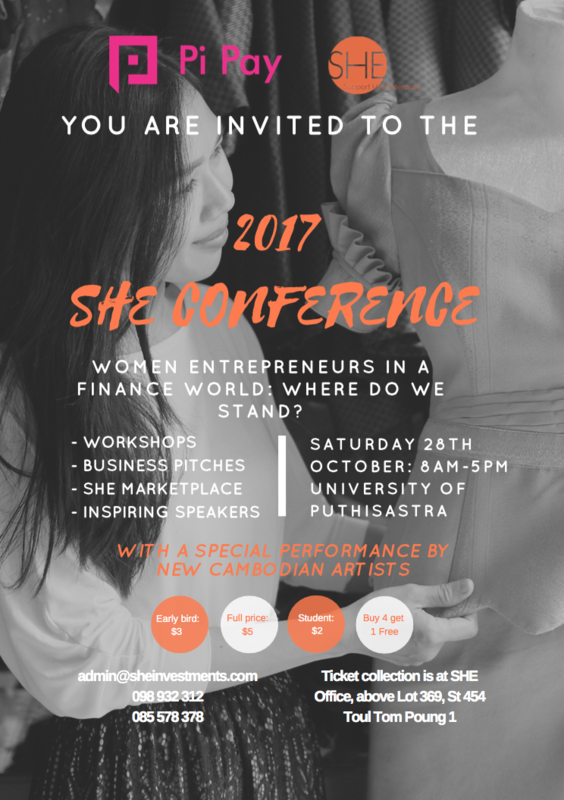 Coming back for its third edition, SHE Annual Conference 2017 will be happening on October 28, Saturday from 8am to 5pm at the University of the Puthisastra! Revolving around the theme of “Women Entrepreneurs in A Finance World: Where Do We Stand?”, this celebration of women’s entrepreneurship and economic participation will discuss how women can participate more actively in the formal economy, especially in the sector of entrepreneurship and financial technology, also known as Fintech. Through the support of SHE Investments’ Gold Sponsor, Pi Pay, this year’s SHE Conference plans to be the largest celebration of female entrepreneurship in Cambodia this year. Following that, there will a chance for Cambodian businesswoman to showcase their products and services at the SHE Marketplace, just like the years before. At the Marketplace, there will be numerous opportunities to meet the talented entrepreneurs who have graduated from SHE’s programs and to discover their products and services. The Marketplace is also open to non-graduates, however all stalls will be occupied by women-led businesses. Four workshops will also take place in the morning covering topics related to business development like Business Registration, Goal Setting and Action Plans, How to Raise Capital, and Financial Technology for Business. During the conference, a live pitching session will happen; done by a selection of SHE graduates. They will pitch their business to a panel of judges for a chance to win money and in-kind prizes to help kickstart their business to the next stage. To complete the day’s events, a Khmer contemporary dance company that focuses on women’s empowerment through dance, ‘New Cambodian Artists’, will perform. Apart from that, the conference plans to gather around 150 delegates from the private sector, government officials, development partners, entrepreneurs, investors, startup communities and innovation hubs. Though the conference is focused on celebrating women as entrepreneurs and discussing how to increase women’s participation in the formal economy, men are welcomed to join in the celebrations as well! Also, all the workshops, speeches and pitches will be delivered in Khmer, but English translation will be available for those who do not understand Khmer. If you are interested in being part of this empowering event, tickets can be now purchased at https://www.eventbrite.com.au/e/she-2017she-conference-2017-tickets-37632167827?aff=erelexpmlt and collected at the SHE Office, located above Lot 369 Cafe and Bar. Early Bird ticket prices will be available till 20 October at just $2.50 and $10 for a group of 5 people. After that, the price will increase to $5 for individuals and $20 for a group of 5 till 27 October. Besides this, students can a special price of $2 as well. So if you want to learn more about what the Fintech scene has in store for the female entrepreneurs of the Kingdom, do keep 28 October free and get your hand on the tickets for the conference soon!